Game Theory: A New Key to Young Adult Fiction? There’s a new book out that I would love to read and discuss with HogPro regulars: Jane Austen, Game Theorist. Game theory and neuroeconomics are a relatively new interest for me in my field, psychology ( though hormones and neuroscience will always be my first love), but that interest has grown thanks to an Honors Course (Phil/Psych 306) I have been privileged to teach a few times with a colleague in the Philosophy Department. We recently completed a class research project using the Ultimatum Game. According to the reviews, Dr. Chwe seems more interested in the Prisoner’s Dilemma, which makes since. 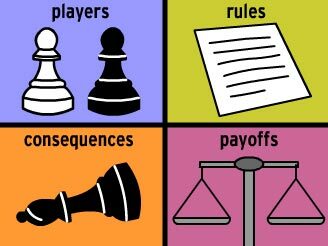 The Prisoner’s Dilemma has been getting a lot of popular press of late, even serving as the basis for a popular game show (I’ve only seen it once, and, yes, both contestants defected and went home with nothing). But with themes like trust, loyalty, betrayal and survival bearing at the heart of so many of our favorite series here at Hogpro, it is likely game theory could give us some fresh insights. Other writers have already applied the Prisoner’s Dilemma to the Hunger Games. Brent Keller points out that a district who trusted each other could request unlimited tesserae without increasing the probablity of any individual child dying the the Games… as long as everyone requested the same number. The economics blog Centives explains Tribute alliances in terms of the Prisoners Dilemma, as does Samuel Arbesman of Wired Magazine. Ally Condi’s Matched series refers to the Prisoner’s Dilemma as one of the limited game choices the youth can play during their free time, although, in the Society’s version, it purely a game of chance that will, statistically, result in equal numbers of wins and losses for both players. Only Ky, the Aberration, knows that the original game involved a human decision-making process and that a favorable outcome depended on two partners absolutely trusting each other. As a fairly recent Psychology student, Veronica Roth likely encountered game theory. Did it, like personality theory and biopsychology, make it into her books? That is something I will consider after I have read Dr. Chwe’s book, but it wouldn’t surprise me. But, it is likely in my own economic best interest to get my semester grades turned in first.